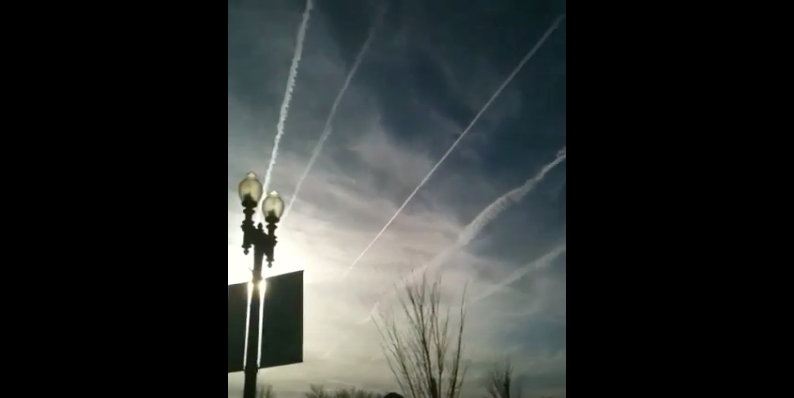 Previous chemtrail operations in Washington, D.C.
VIDEO: Massive Chemtrails Spraying in Washington D.C.
Let’s face it, the geoengineers, who have been chemtrailing the skies across America since the 1970s (Yes, they were doing it regularly back then. ), can artificially create any type of weather event anywhere they so choose. Droughts and deluges around the globe have been quite purposefully geoengineered by the weather weaponry controlled by DARPA (Defense Advanced Research Projects Agency) and conducted as secret military operations by the U.S. Armed Services. As a matter of fact, weather weapons have now become so advanced technologically and effective militarily that it they routinely used to confuse the ‘enemy’. The second Iraq War prosecuted by George W. Bush saw a number of weather events come out of nowhere that threw Baghdad into chaos. Likewise, during President Clinton’s unlawful war against Serbia, it was widely reported that the weather was being manipulated in ways never seen before anywhere on planet Earth. Did The U.S. Military Use Weather Weaponry Against Belgrade During The Yugoslav Wars? No matter where you live in the 50 states, chemtrails have become a regular sky phenomenon. So much so, in fact, that many people can actually predict the weather by the intensity of the chemtrail operations and especially the duration of the spraying. There is no better way to rain on someone’s picnic (or parade) than to chemtrail the region for a few days before the picnic/parade is scheduled. The entire South has been chemtrailed like crazy over the course of this week—Inauguration Week. Reports have been coming in that TPTB want the whole country under overcast skies. Rain is predicted for many areas, especially Washington, D.C.
Not only do these chemtrail aerosols cause the now pervasive Chemtrail syndrome, they also trigger people according to their mind-control programming. Angry people get angrier; sick folks get sicker; and crazy liberals get crazier. The same works for the Trumpsters: their strong feelings toward and support of President Trump only intensify, which can make for an explosive situation…particularly on the National Mall in D.C.
On a purely physical level, radical changes can be triggered by the various toxins found in chemtrails and chembombs. This is due to the fact that each chemtrail aerosol formulation has a different mix of chemical constituents which affect human biochemistry. What they spray on ultra-liberal San Francisco in order to fire up their anti-Trump sentiments is different from what they spray on super-conservative states of Alabama and Mississippi. Even the Sunshine State gets intensely sprayed as discussed by a Florida attorney in the following article. There are also the HAARP frequencies that are now conveyed through the chemcloud cover which can profoundly alter the mind and emotions, as well as one’s energy level and/or physical state of dis-ease. The critical point here is that the American people are being systematically manipulated by the deleterious effects of chemtrail spraying nationwide. There is no city or state, county or community that is immune to such chemical assaults. For those who are blissfully unaware, the government can utilize chemical geoengineering techniques to fabricate any weather event so desired. This is quite easy for them as many have witnessed in their respective locales. Hence, manufacturing a rainy day explicitly for the Donald Trump-Mike Pence Inauguration is really quite simple for them. Here’s the Weather.com forecast for today. 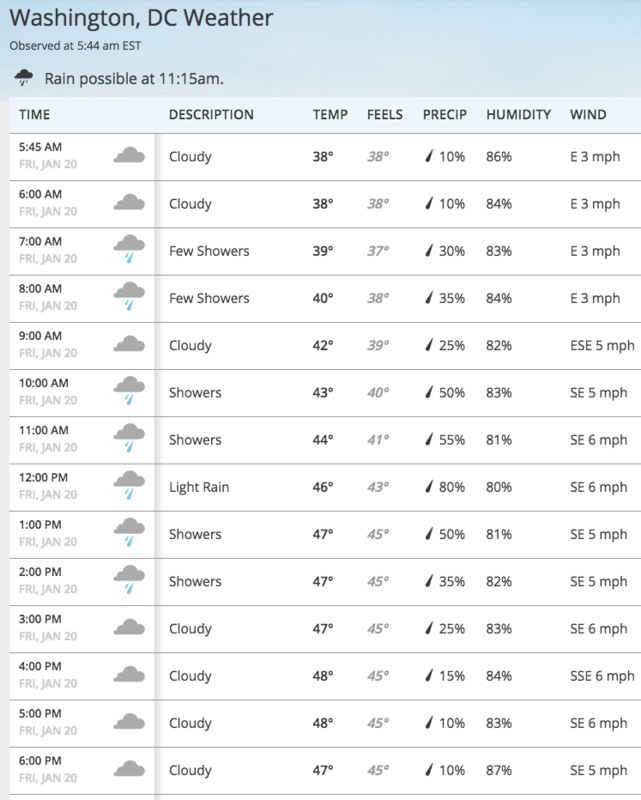 Notice the exact times when the rain is predicted to begin. If ever there was a parade that the NWO globalists would like to rain on, it is The Donald’s. Not only has he dismissed their totally fake CO2-driven Global Warming scam narrative, he has also promised to disengage from the fabricated Paris Agreement (within the United Nations Framework Convention on Climate Change) that Obama aggressively promoted worldwide. There is no greater attempt by the New World Order cabal to foist a One World Government upon the entire planetary civilization than the original Al Gore-hawked Global Warming fraud. As an aside, Gore was promised a Nobel Peace Prize and the pole position for the whole Global Warming farce, if he dropped his legal initiatives that contested the stolen election of 2000 by the Bush clan. And so he did. Some political insiders even say that he also lost his wife Tipper over the same deal made with the devil. The bottom line here is that the Globalists and geoengineers alike do NOT like President Donald Trump at all. Both will be out of a job once the new POTUS rolls out his fiercely nationalist agenda. Therefore, if TPTB cannot be a skunk at the inaugural balls, they will at the very least rain on his inaugural parade. They will make the weather very inclement indeed, just as Obama & Company have been extremely uncooperative throughout the entire Trump transition process. 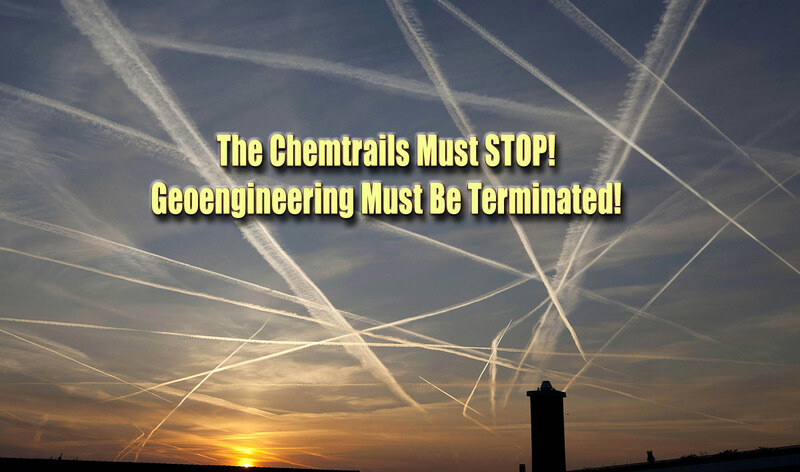 ← Mr. President: Please, PLEASE Shut Down The Chemtrails On January 20th!